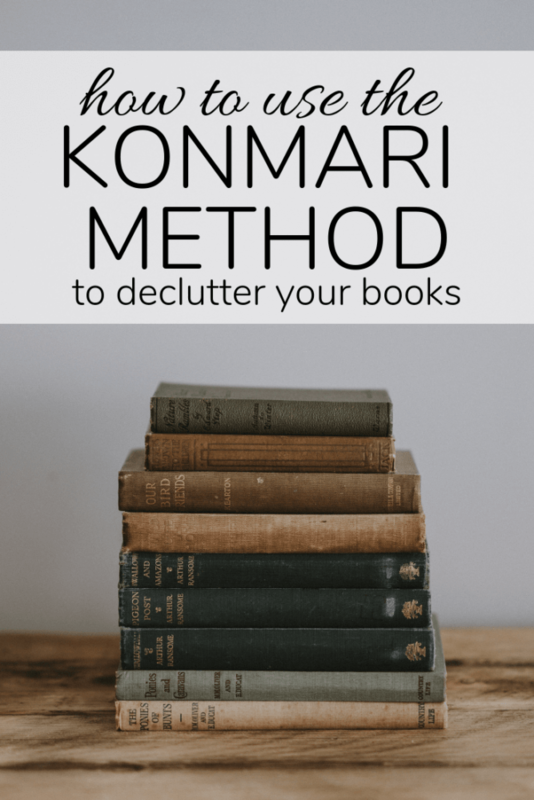 We’re going through the KonMari method in our home, and this week we’re decluttering our books. Hear my thoughts on getting rid of books, and see how we organize ours! It’s week two of organizing our home with the KonMari method, and I’m feeling good! My closet and dresser drawers are still totally organized and my clothes are beautifully folded, so I’m calling it a win. This week’s video is shorter than last week – I don’t actually keep a ton of books in our home, so this process was straightforward for me. Be sure to watch the video if you want to see exactly how I approached this with our five-year-old. He was fully involved in deciding which of his books he wanted to get rid of, and he did a great job! Let’s just get this out of the way right now: getting rid of books is a very controversial topic. Many people balk at the idea of ever getting rid of any books and can’t fathom the idea of going through their books to decide which ones to purge. If that’s you, great! Each and every one of your books clearly brings you great joy and you should keep them all. You can move right along to paper. But, if you aren’t absolutely gutted at the idea of purging a few books from your collection, read on. Here’s my take: I’m a voracious reader. I’ve read five books so far this month and am currently working on my sixth. We read with Jackson every night before he goes to bed. My family loves books. I don’t think that I need to keep every single book I’ve ever owned, and I don’t think my son should either. As much as I love to read, there are only a select few books that I really re-read over and over. My very favorites. The best of the best. Books like The Shining and Alice in Wonderland and the Harry Potter series are all books that I’ll read again and again, so I would never consider purging them from my collection. But, that one random book that I read and enjoyed but don’t intend to pick up again? There’s absolutely no reason for me to keep that book in my library. That book is doing me no good just taking up space on my shelf, and someone else could easily be enjoying it – so why would I keep it? I have a very small collection of well-loved books that I keep on my shelves. Beyond that, I actually don’t tend to buy books very often. I read books from my local library or through Amazon Prime Reading, so I’m never tempted to allow my book collection to get out of control. Personally, I’m an advocate of only keeping the books that you know you’ll re-read – the ones that make you immensely happy (or immensely sad! the ones that make you feel something). Let all of the other books go to a different home where they can be enjoyed by another person. Purging your books follows the same process as your clothes – first, you’ll pull every last one of them out and make a big pile. Then, you’ll go through and look at each one to determine if you want to keep it or not. The books you want to keep go back on your shelves, and the books you’re ready to let go of can go to a local used bookstore, the library, or a friend. Technically speaking, the KonMari method isn’t actually about getting rid of things! The KonMari method is about only having items in your home that you love and that bring you joy. If you have no desire to get rid of something, don’t feel guilty about it – keep it with confidence! The whole point of this process is to get rid of the noise and reduce your possessions to only the ones that matter. If having hundreds of books really truly matters to you, then do it. Since I already have such a small book collection, this is where the majority of my work fell this week. I had Jackson help me lay all of his books in the living room. 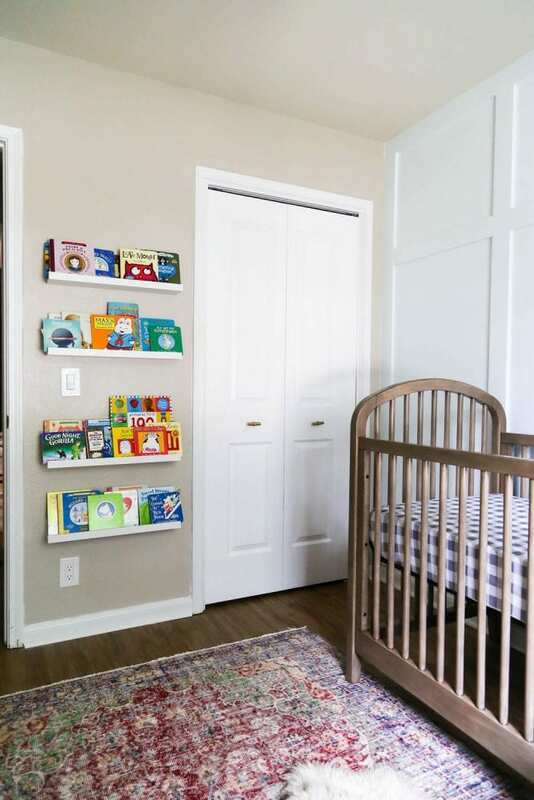 This way, he was able to see the sheer number of books he had. Even at five years old, he understood that it was kind of an absurd number of books. I explained that we’d be going through to decide which ones he had outgrown or just didn’t love anymore. I told him that once we were finished, we’d take all of the books to our local book consignment store, and that any money we earned off of the books would be his to keep. Then, I went through the books one by one with him. I tried really hard not to question any of his choices, other than modeling a few of the first books (for example, grabbing a board book and explaining that it was meant for babies, or showing him a book that was badly damaged). Once we were done, he helped me put them all back on the shelf. I emphasized that books are something to take care of, and that they should always go back on the shelf when he’s done. I kept my promise and when we had finished deciding what to purge, we took the books to the store and he got a whopping $13. I let him spend it on anything he wanted, and he was thrilled. So far, he’s done a great job of maintaining the work we’ve done. His room is in desperate need of decluttering in other areas (can’t wait for komono! ), but his books have been nice, neat, and organized for about a week now. That’s a lifetime when you’re five! I feel great about our progress this week, and I can’t wait to hear how things are going for you! 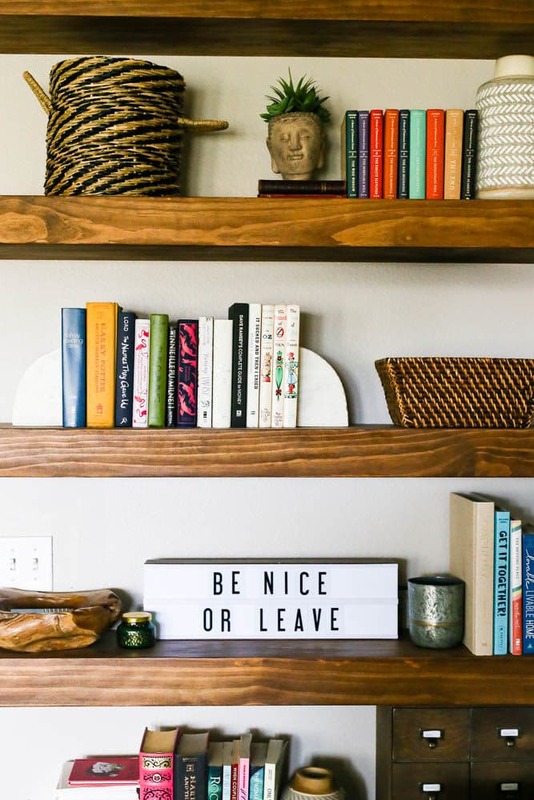 Do you hoard books in your home, or do you feel okay about letting go of a few? Be sure to subscribe to our YouTube channel if you want to be the first to see any of the new videos in this series! I’ll be back next week to chat about papers – this will be a big week for me!